The Warrior is now fully functional minus shifter and brakes! The steering and efficiency seem amazing so far! Siting in the pilot's seat makes me feel evil and crazy at the same time! Rather than rush and burn out, I am stopping here and will finish the rest of the trike once back from camp. No doubt, this will soon be my main ride! Not much left to do besides the rounded profile seat, brake mounts and paint, so I estimate completion by August 12th or so. After that, I will take it out for a real abuse test and then begin the plan compilation if there are no bugs to be worked out. So far, I can't see any. After almost 10 tries at getting the steering exactly the way I want, the battle was finally won. Using the StreetFox Ackermann design (I knew that had zero scrub), I tied into the WildKat under seat steering parts. - Perfect Ackermann steering with zero tire scrub. I have also heard about this "we wanted tire scrub to slow down our trike in corners" thing, but honestly, I find it to be a flaw. Brakes are for slowing down, not worn tires. I know, I am picky! - Steering must move to the full range of motion before lockout evenly. This was extremely difficult to archive. Having the control arms parallel to each other actually caused a massive imbalance to one side. - Handlebars must sit perfectly where the hands drop, not some awkward locked elbow stretch, or uncomfortable bend. They are also adjustable. - There must be room for the chain under the seat! The first small photo shows how far off from parallel the two control arms are from one another (white lines). This is what took the longest to find, and required many cuts, re-welds, and new control arms. I wasn't going to give up until the two front wheels made the same angle of turn as the handlebars moved left and right. Parallel gave a decent amount of turn, but on one side, lockout occurred at almost 3 inches (15-20 degrees) more. The head tube control arm is also 1/2 inch longer than the wheel arm to introduce some mechanical advantage, which gives a bit more stability and kind of a "power steering" feel. The last two small photos show how the wheels move to the maximum lockout equally compared to the handlebars for left and right turns. Tomorrow I add the chain and brakes, so it's smooth sailing from here! We are heading to camp for a week on Friday, so The Warrior plan will probably be released mid-August. Thanks for all of he comments and input - it's been a lot of fun so far! After many hours of welding, cutting, drilling, then cutting and welding again, I have decided that not only is the crossover steering system much to finicky to get right, it is not nearly as good as the simple tied Ackerman system. Even with a huge bucket of miscellaneous steering rods, plates, and do-hickeys, it took all day to get this to work (with luck). In the end, it was almost impossible to achieve a good balance of turning radius and wheel scrub, so I am scrapping that idea. Even on the commercial trikes that us this system, I have heard reports of wheel drag in sharp corners, and to be honest, that is just not acceptable to me. I am going back to a system much like the StreetFox, but will just tie into the right control arm like I did back in the dark ages on my Marauder trike concept. This also makes alignment easy (no guessing), so that is so much better for the plans. I did manage to get chain clearance and the under seat steering to work nicely, so it was not a fully wasted day. I know... I can't win-em-all, but that doesn't mean I can't throw my wrench across the room and cuss out loud, right? Warrior Racing Trike update - wheels are on! Well I had a good 4 hours in the garage today, and here is my progress so far (in multicolor). Taking a break and then going back to work our the steering details. I have this funny feeling my new "main" ride is about to be unleashed. That is my hinged test seat - the final one will have real curves. It was a bit of a slow start today, but I did manage to cut the head tubes, shorten the stems, and then weld the tabs to the crowns at the proper Ackermann angles. The two cross booms are also cut, but I don't run my grinder after 11:00 pm, so the rolling frame will have to wait until tomorrow! After that, it's just the simple stuff like chain routing and steering bits. 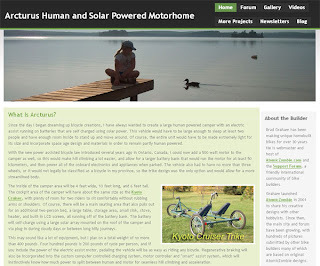 Since this is an ongoing project that many people have expressed an interest in following, we decided to devote a web site just to the Arcturus Human and Solar Powered Motorhome. Brad hopes to do some work on it every month, time permitting, and have most of the main frame and transmission done this year. If all goes well, we hope to have the fairing done in 2010, then work on the interior. It will be a bit of an investment, so will have to budget this one carefully. The main reason we want an HPV-solar motorhome is for camping and short trips in our region to enjoy the outdoors. Since we had to part with our Duct Tape Palace tent trailer this year due to its deteriorating canvas, we have to take our tents to campsites. Arcturus will be an engineering feat for us, and a practical vehicle that will run on human, solar and an electric power assist motor. We can only work on it from time-to-time because it takes up so much room in the garage. Updates of the project will be posted as soon as they become available, so stay tuned. Warrior Racing Trike - more progress! Tomorrow i actually have a full day out in the garage so I hope to have at minimum a rolling frame, and if things really go well... a rolling frame with steering and disc brakes completed. The 5/8 bolt and tab system really worked out well with those standard 20mm hubs, and disc brake setup will be a breeze. What took the longest tonight was hand filing the 1/2 thick tab holes from 1/2 inch to 5/8 using a hand file! Some days it would be nice to have a drill press, or even a chop saw, but then I loose bragging rights! Warrior Tadpole Trike Build - progress! I have also come up with a way to dampen road shock at the rear of the frame that does not require suspension. So after 2 days, I have the rear and main boom complete, so I am able to sit on my temporary seat and pedal. After several tests, I have come up with a very simple way to use 20mm hubs with disc brakes on a tadpole trike without needed any machined parts at all. It uses an easy to align (for Ackermann) tab system much like the StreetFighter, and only needs a pair of 5/8 bolts and some spacer tubing. This keeps it safe, robust, easy to align, and best of all.... inexpensive! In the photo, you can see the bolt through the hub, although I will be using a fine thread with locknuts and probably a hex head for that professional look. I start on the steering parts tomorrow, and hope to have a rolling frame over the weekend! So far the frame is based on 1/2 marauder and 1/2 DeltaWolf. August newsletter is online, reader survey - win a prize! Take our newsletter reader survey and you might win a prize! Thanks, John, for your email. Your Marauder looks great! Congrats on accomplishing your first AZ project. We hope to see more! John's Marauder and more cool bike projects can be seen at the Builders Gallery www.atomiczombie.com/gallery.htm. While taking some time between races at the Tour de France, cycling champion Lance Armstrong extended his get well wishes to the group of Ottawa cyclists hit by a van around 8 am on Sunday while the group was riding in a designated bicycle lane in Kanata, near Ottawa. The Ottawa Citizen newspaper reports that one of the cyclists is still in critical condition. The injuries range from head trauma, to broken bones and possible internal injuries. The group were training for a triathlon in September. The driver of the van who hit the cyclists fled the scene and later turned himself to police. The 45-year-old Ottawa man is currently in jail awaiting a bail hearing. Greetings Atomic Zombie Krew members. We are pleased to announce that there are two new projects ready for download. - Two independent transmission systems. - Overseat and underseat steering. - 209 high resolution color photos and illustrations. - 198 pages of step-by-step instructions. - Tons of handy building tips! - How to choose a hub motor and batteries. - Sleek and built for speed. - 66 high resolution color photos and illustrations. - 73 pages of step-by-step instructions. These and other projects are available for download on the Atomic Zombie site: www.atomiczombie.com . And, don't forget to send in pictures of your completed homebuilt bike projects, too. Check out the Builders Gallery for information on how you can be a star in the gallery! These types of tragedies can be avoided. They were in a designated bicycle lane for crying out loud! Even riding in a designated bicycle lane isn't safe. Hope these people will recover successfully and the driver gets jail time and license taken away forever. Runs down five people and leaves the scene like a coward. Driving is a privilege, not a right. These dangerous drivers should be permanently banned from operating any motorized vehicle. LodeRunner 2 tandem cargo trike is done! We hope to have it available for download tomorrow (Sunday). Will post announcements here and in the forum when it's available. This one was so much fun to ride. We took our nieces to a park and tooled around for over an hour. 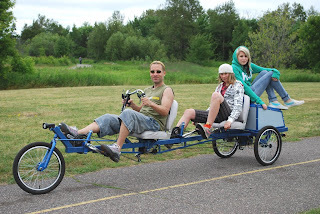 The LodeRunner 2 tandem trike will be great for taking out to cottage country and doing shopping around the city. The recumbent design is comfortable for short and long rides. We can fit most of our weekly groceries in the cargo area, which is why we wanted to have a tandem this time. This way, we can both get some exercise and get groceries, too. The gas prices here haven't gone down much this summer yet, so it will be great to leave the gas guzzler at home as much as possible. 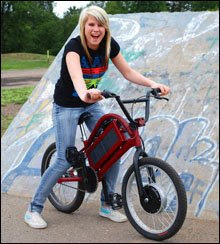 The E-Style Electric BMX is a fast and rugged human/electric hybrid that operates without making any noise. For only a few pennies to fully charge the batteries, you can zip along on roads, bike paths, and off-road trails without bothering your neighbors at home or at the cottage. The E-Style BMX is perfect for the road, as well as the trail, and it allows you to slip silently along without even being noticed, which is a bonus in places where laws have yet to classify these small electric vehicles. The E-Style BMX can be built to travel well over 30 miles (50 kilometers) on a single charge, and will do so at speeds equal to or greater than some posted city speed limits. Because the E-Style BMX is built around the battery pack and the type of hub motor you choose, you can build the base vehicle to suit your needs, altering the top speed, acceleration, weight or range. Many inexpensive electric scooters have chain driven drive wheels or gear reduction motors, so they make a lot of noise, or suffer from inefficient power transfer, but the E-Style BMX features a quiet and efficient hub motor design that can spin up dirt and climb hills without any problems. The E-Style BMX looks much like a typical freestyle BMX, and includes all of the standard safety equipment, so you will be able to ride happily on public roadways and recreation trails without disturbing the peace. Because the pedals are still functional, the E-Style BMX also can be made legal in most places that now include electric assisted bicycles in their bylaws. 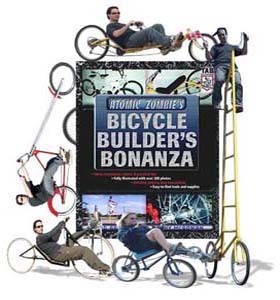 A whopping 17 new projects are now a part of the growing Atomic Zombie bike hacking community. This month's additions include: tall bike, trikes, trailers, choppers, electrics, long wheel base recumbent, trailer, lowracer recumbent and crazy bikes. Soledad Hassett of Melbourne, Australia, built this OverKill style chopper . And, there are six new crazy bikes, five of which were submitted by Cap'n Bikebeard and company from Bristol, England. There are many more cool bike projects in the gallery, so be sure to check them out - www.atomiczombie.com/gallery.htm . Peter (University of Toronto student) spent the night in our make-shift guest room as it was getting dark and we all ended up chatting until the early morning hours. He spent hours in the garage with Brad marveling at the latest AZ projects and the electronics stuff Brad's been working on. He got to see the soon-to-be-completed Terminator Chopper, the LodeRunner 2 Tandem Trike, E-Style Electric BMX and Arcturus Solar and Human Powered Motorhome, as well as DeltaRunner Trike and Streetfighter Quadcycle. "I can't believe I'm finally meeting you in person," Peter said. 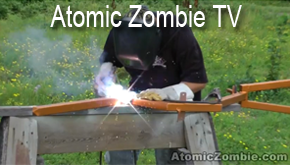 We don't meet many like minded garage hackers here, especially into bike building so it's kind of strange hearing that Atomic Zombie has quite a following in the Greater Toronto Area and abroad. We were impressed to learn that Peter and ther students have been involved in grassroots projects helping to fix and refurbish bikes, even choppifying bikes for younger riders. He's so enthusiastic about do-it-yourself projects and having a zest for life. Before he dives in to his practical training as a medical student this fall, Peter decided weeks ago to pack up his motorcycle for a Canada tour, stopping along towns, cities and sights along the way. It's the first time he's ever traveled throughout Northern Ontario and western Canada. It's an eye-opening journey, and he's enjoying the varied scenery, meeting folks along the way, especially those he says have influenced him. So, it was a dream come true to finally meet the real Atomic Zombie in person. The guy was just beaming! He and Brad talked for countless hours, followed by a BBQ here, and a ride on our recumbents around the neighbourhood. Peter left late this morning after a light breakfast. I packed him some homemade oatmeal cookies and bran-cranberry muffins that I baked last night for the journey westward toward Dryden and Kenora, some AZ gear and a book, "Dances with Dependency: Indigenous Success through Self-Reliance". He will reach Saskatchewan this weekend to visit friends, then journey back this way in a week or so. Hope he stops by for another visit. You know boys, I love the taste of concrete in the early afternoon! The local boys survey the damage to my bike and my body. Although I was planning to advise against using an aluminum front suspension along with any hubmotor, I decided to play the fool and see how well it would hold up to some hard riding. Aluminum + hubmotor = missing teeth! I came flying into the parking lot of a coffee shop at 50km/hr and as soon as the front wheel hit the curb edge, the dropouts snapped off and I went down for the count. The bike rolled over me twice, and although I have a bad ankle and some "cool looking" road rash, I think I ended up much better than the bike. The forks and frame are bent. The rim is warped and there are damaged spokes. The wires have ripped right out of the hubmotor as well. DO NOT consider using any aluminum frame or forks with a hubmotor. Aluminum fails instantly without warning and becomes brittle over time due to vibration. Now I get to limp for a week and spend the day picking little rocks out of my palms. At least now I have a photo for the plans showing why aluminum forks are bad for electric bikes! It was an uneventful national holiday yesterday. The rain held off all day so the fireworks at the marina went off as planned. We just hung around at home doing some odds and ends, nothing special. Had a nice dinner with East Coast lobsters, though. That was a real treat. Mike of Pennsylvania sent in a photo of his old skool chopper with lots of chrome and black accents. The talented gang at Crank It Up Cycling for All in UK sent in another amazing build. This one is modeled after the Atomic Zombie OverKill chopper. Mike from Illinois sent in this one based on the HighRoller short wheel base recumbent design. This trike beauty from Jon in Maryland is made of carbon fibre and maple seat and accessories. A true work of art! There are many more cool bikes in the Builders Gallery, so be sure to check them out and log on to the forum if you have any questions or comments about these and other projects. The July issue of the Atomic Zombie newsletter is now online here: http://www.atomiczombie.com/newsletter/july-2009.pdf. As for current bike projects, the Terminator Chopper is almost done, in addition to the E-Style BMX and the trike/quad cycle, tentatively called Quadzilla, but the name is probably going to change, as well as the final design. Looks like it will be a trike now. Some issues about the braking and cabling system, so the trike may be more feasible and less complicated than the quad design. Stay tuned to the forum for updates and announcements. We're already in July and anxious to get at least a couple of new projects online this month. Have a safe Independence Day long weekend to our friends and family in the USA.